This giveaway is now closed. Thank you so much to everyone who entered, and congratulations to Kara (who won a one year subscription to Kinfolk Magazine) and Elle (who won a Lauren Moffatt scarf)! Again, a big THANK YOU to everyone who participated! Today is the 10th day of 24 Merry Days, a virtual advent calendar with a new giveaway everyday (I talked about it here). Today is my day, and I have two fabulous prizes for you to win! 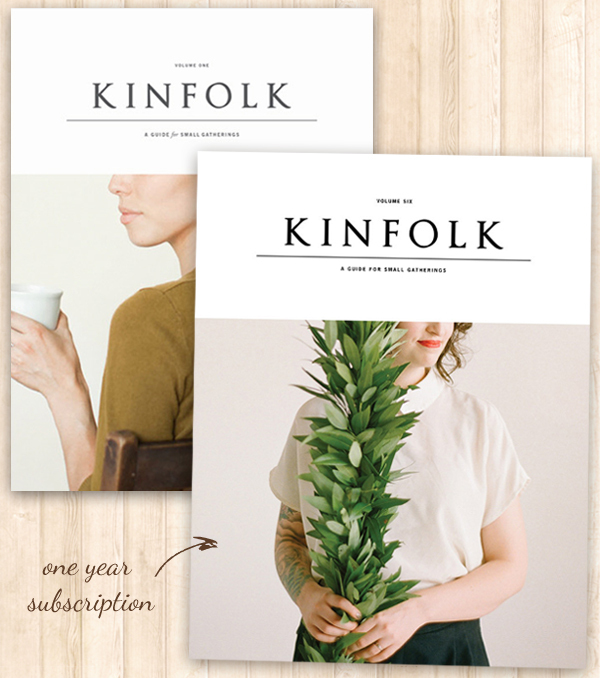 The first prize is a one year subscription to Kinfolk magazine. Kinfolk is a magazine about small gatherings and the wonderful warm intimacy that occurs when family and friends sit around the dinner table. It's a beautiful, organic, heartfelt injunction to break bread, share laughs, and clink glasses with the ones you love. As they say in their manifesto, every element of Kinfolk—the features, photography, and general aesthetics—are consistent with the way they feel entertaining should be: simple, uncomplicated, and less contrived. Picking up a copy and flipping through the pages instantly makes you feel warm, peaceful, and comfortable. The Kinfolk Dinner Series is also pretty amazing. Each month, they select a city in the US and Canada and collaborate with local partners to serve up a magical dinner party. Visit their website to learn more. Words nearly fail to describe Lauren Moffatt's exquisite style. Her use of patterns and textures, her color palettes, her unique balance between whimsical and sophisticated, are just perfect. Each of her pieces combines femininity, grace and simplicity. Well, a look at her current collections will describe her elegance better than a thousand words. Open to U.S. residents only- sorry, rest of the world! Leave a comment below telling me your favorite item from Lauren Moffatt and the issue number of your favorite Kinfolk magazine cover. - Share 24 Merry Days on any social media and leave another comment telling me you've done so. The giveaway runs for 7 days and ends on Monday, Dec 17th at midnight PST. A winner will be selected by random for each prize (two winners total), notified by email (please be sure to provide a valid email address) and announced on this post. Best of luck, and be sure to visit 24 Merry Days for more giveaways! Miss lonelyhearts stripe top is my fave by Lauren. Already "like" her on facebook. Volum 4 is my favorite Kinfolk cover. Rad contest! I love the Nora hooded peacoat and the cover of Kinfolk Issue 5. I love a man with a pan. I love The Bell Jar Esther Short Skirt and the cover of Kinfolk Issue 2. Thanks for the wonderful giveaway! I love the Portrait of a Lady Isabel Sequin Shell and the cover of issue #1 of Kinfolk! I liked Kinfolk on facebook! I also like Lauren Moffatt on fb! i love "PORTRAIT OF A LADY STRAPLESS DRESS" - that gold!!! And tweeted about 24 Merry Days! Oh my goodness! I adore Kinfolk and Lauren Moffatt! My favorite issue is number 5, and I love the miss lonely hearts stripe top from Lauren Moffatt! Fingers super duper crossed! I like the Bell Jar Esther Short skirt. Volume 1 because there is something about a cup of coffee! I love Volume 4 of Kinfolk - so romantic! And I couldn't get Lauren's website to work on my computer - but I love the scarf of hers you pictured! :) Hope I win! As for the Kinfolk cover, I'm partial to volume one. I love the coziness of it. volume four is my absolute fave! and I also love the wuthering heights dress. like oh the lovely things! I love the Wuthering Heights Cathy Silk Dress. The lace detail really makes the dress special. My fav Kinfolk cover is Vol. 4. That scene reminds me of where my husband and I vacation on Lake Superior every fall. love the Dorian Grey silk collar sweater. I've honestly never held a copy of Kinfolk in my hands so I dont have a fave issue! but i would love to have them all for the browsing! I love the cover of volume 1, and the Bell Jar Esther Snap Dress by Lauren, so cute! liked oh the lovely things on FB! My favorite item from Lauren Moffat is the Wuthering Heights Cathy Silk Dress and I like Kinfolk's Issue 2 cover! I liked Kinfolk on facebook. I liked Lauren Moffat on facebook. I liked Oh the lovely things on facebook! I love the Lauren Moffat Ace String Triangle Bikini, gorgeous! I liked Lauren Moffat on Facebook! I liked Oh the Lovely Things on Facebook! Thanks for the chance to win these lovely things! I shared 24 Merry Days on Facebook! Volumne 6 is my favorite and I love the Passenger Side Dress w/ Shell. I love the To Kill A Mockingbird Scout Mini Skirt and my favorite Kinfolk cover is Volume 6! Also, I liked Kinfolk on facebook! I love the cover of Kinfolk Volume Four - its is the perfect moment, captured. From Lauren Moffat's collection, I have been lusting over the "Jerry was a race car driver" dress from the Spring and that is still my favorite! I love the PORTRAIT OF A LADY STRAPLESS DRESS and Volume Four cover. Both so very pretty and charming. Thanks for the wonderful giveaway! I'm of course an oh the lovely things fan! I like the volume 4 Photo from Kinfolk and the Lauren Moffatt Portrait of a Lady Isabel Sequin Shell. I'm a fan of Lauren Moffet's Ponyboy Monogram Sweater and Kinfolk Volume 2. I liked Lauren Moffett on Facebook. I liked Oh the Lovely Things on Facebook. I shared 24 Merry Days on social media. My favorite thing from Lauren Moffatt was the Hit The Road, Jack Dress. Also I loved the Kinfolk volume four cover. I love the Wuthering Heights Cathy Silk Dress and the cover of Issue 4 of Kinfolk! I already liked Kinfolk on facebook! I liked Lauren Moffatt on facebook! Liked Oh the Lovely Things on facebook! Oh goodness! I would love to win these! I've had my eye on Kinfolk for a while but have yet to read it but I know it will be a favorite! And I love the Hit the Road Jack dress! It's darling! I love the Portrait of a Lady Strapless Dress from Lauren Moffatt and the Volumen One cover of Kinfolk--it's frame-worthy! 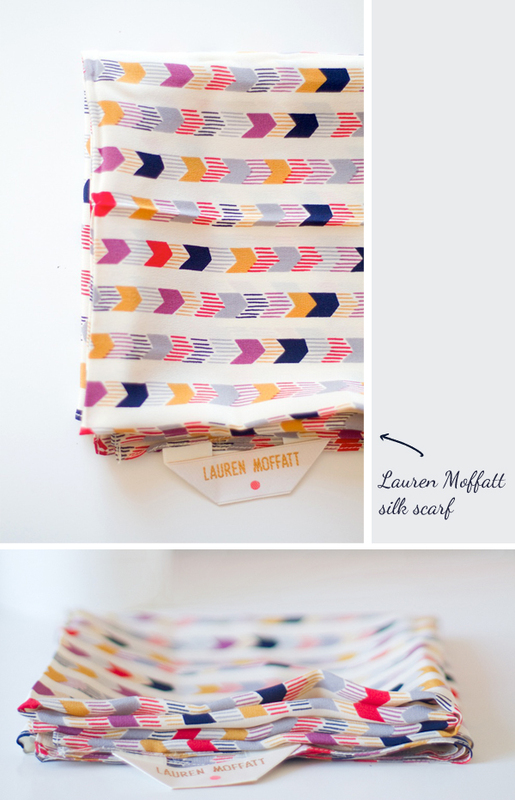 Volume four has the loveliest cover and favorite lauren moffatt items is the lonely hearts stripe top, it's so cute! I LOVE Kinfolk. This is so great, because a subscription to the magazine is actually on my Christmas list. I love getting friends and family together for simple, intimate and heartfelt dinners. My husband and I love quality time with good friends. My favorite cover is volume 4. I love the warmness of the couple. I am loving the Nora Hooded Peacoat by Lauren Moffatt! So adorable and cozy. I love the Ponyboy Monogrammed sweater on Lauren Moffatt's site and the cover of Kinfolk's 4th issue (though it was a hard choice, they're all lovely). I have been super in love with Lauren Moffatt's Wuthering Heights Cathy V-Neck Top for ages now. Love love. And Kinfolk vol. 4: so, so sweet. and I liked Kinfolk on FB. and I liked Lauren Moffatt on FB. Wuthering Heights Cathy V-Neck Top and Volume 6! My Favorite Kinfolk cover is Issue 4 - gorgeous, warm and inviting. I love the Wuthering Heights Cathy Silk Dress and Kinfolk Volume 6! I liked Kinfolk on fb. and Lauren Moffatt on fb! and Oh the lovely things on fb! I love Volume 3 and now I need the Miss Lonelyhearts striped top in my life! I liked Lauren Moffatt on Facebook. Thanks! I love the crosstown traffic mini skirt from Lauren Moffatt and the cover of the third volume of Kinfolk. I love the portrait of a lady strapless gown from Lauren Moffatt & I like the pop of green on the volume 6 cover of Kinfolk. I love the Gone with the wind Scarlett top from Lauren Moffatt, and volume one of Kinfolk! Thanks so much for a wonderful giveaway! I love the Portrait of a Lady Isabel Button up blouse. Kinfolk has been on my radar for a while and I'd love a subscription. My favorite cover is volume 4. I love that scarf! but I also do love the Great Gatsby Daisy Scarf dress! and the cover of volume 6 of Kinfolk has beautiful composition and the colors are lovely. I love the Nora Hooded Peacoat. My favorite cover of Kinfolk is No. 4. I'm crazy for the Mansfield Park Fanny Snap Top and Volume One of the Kinfolk magazine. Lovin' this giveaway. I like the Volume 4 cover and the Portrait of a Lady Isabel Sequin Shell - what a great top for holiday parties! I also liked Kinfolk on Facebook. I also liked Oh the Lovely Things on Facebook. I love volume 3, because I know I live for the weekend with how busy my weekdays are. I wish I knew how to make the most of my life in the inbetween time as well! Also the To Kill a Mocking Bird Scout Coat is adorable! I love being a tomboy. Kinfolk's Volume One cover is classy and Volume Four is super sweet! From Lauren Moffatt I really like the yellow Ponyboy Monogram Sweater. Thanks for hosting the giveaway! Happy Holidays!! LOVE lauren moffat's stuff... my favorite would have to be THE BELL JAR ESTHER SNAP DRESS. and i love KINFOLK VOLUME 4 - the couple looks so relaxed, happy, chilled out, and enjoying each other's company. I love the Wuthering Heights Cathy and the Kinfolk Volume 4! love the WUTHERING HEIGHTS CATHY V-NECK TOP and kinfolk #6.
liked oh lovely on fb! and again, for a 3rd chance to win - i have "liked" your facebook page as well. so happy to have been introduced to your fabulous blog from this fabulous giveaway! I liked the 'Oh the Lovely Things' blog Facebook page. I love everything about the current Kinfolk cover, issue 6, and find myself staring at it a bit too much! My favorite from Lauren Moffat is the Miss Lonelyhearts striped top since I love all things stripes. I think my favorite is the scarf featured right here! But I also dig the colored jeans on her website. Kinfolk #5 is my fave! Cast iron skillets are on my Christmas list! Also, already Liked both you and Kinfolk on FB, and just Liked Lauren Moffatt as well. Wow, Lauren Moffatt's To Kill a Mockingbird Scout Coat is amazing. I've never read Kinfolk but it looks right up my alley, I lovve the cover of their first volume. From Lauren Moffatt loved the Portrait of a Lady Isabel Midi Skirt | from Kinfolk Magazine, issue 4 please! I like Kinfolk on FB! I like Lauren Moffatt on FB! ...and finally...I like Oh the Lovely Things on FB! Liked Lauren Moffatt on Facebook. volume 4's cover is adorable! i LOVE the v-neck sequin dress from lauren moffatt. perfect for the holidays! liked lauren moffatt on fb! Love volume 6 cover and the Portrait of a Lady Isabel Strapless Dress. Um. First, EVERYTHING! But in a seriousness, the Nora Coat. To DIE for! My favorite Kinfolk cover is Issue 2. I have to agree, Volume 4's cover was inspired! Fave item from Lauren Moffatt: Portrait of a Lady Isabel Button Up Blouse. I have liked Kinfolk and Lauren Moffatt on Facebook! I love the Ace Ruffle Bandeau from Lauren Moffatt and my favorite Kinfolk is issue number 4.
my favorite item from lauren moffatt is the 'jerry was a racecar driver dress' and my favorite cover from kinfolk is #6! I like Lauren Moffatt on Facebook. i like kinfolk on FB. I like Kinfolk Magazine on Facebook. i like lauren moffatt on fb. i liked oh the lovely things on fb too. thanks for the chance! I like Oh The Lovely Things on Facebook. I am a big fan, thanks for the chance! I really like the Dorian Grey Silk Collar Sweater from Lauren Moffatt and the second issue Kinfolk cover. Shared 24 Merry Days on Facebook! Liked Lauren Moffatt on Facebook! I love the JO PANT-RED and volume #5 cover. I Like Kinfolk on Facebook.